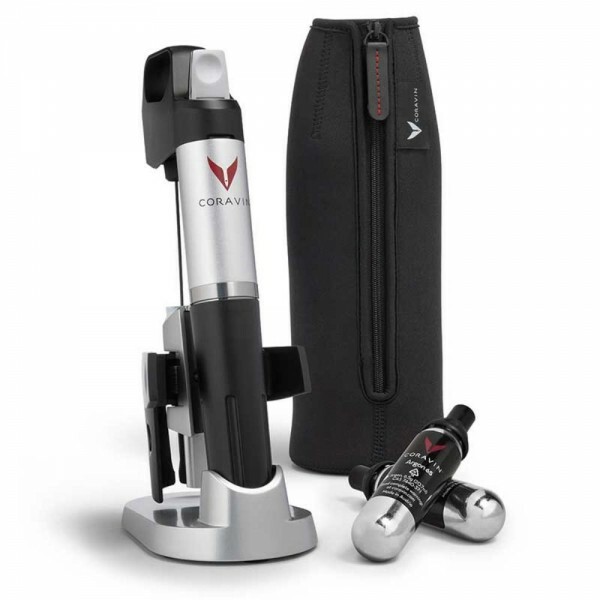 Coravin 1000 Wine Access System (P/N 100001). Using a non-coring medical-grade needle that inserts through the cork, Coravin allows you to taste your wine without opening the bottle. Limited time only, get 4 free Argon capsules with purchase while supplies last. When you're ready to pour, use the wine-on-release trigger to pressurize the bottle. Angled pours result in clean and even results. The high-tension bottle clamp ensures stability, and is adjustable to fit multiple bottle sizes. After the needle is removed, the cork reseals to maintain a perfectly unopened bottle.